Railroads rode the cutting edge of transportation technology in the 19th century and, as with any new development, certain limitations soon became apparent. Although railroads themselves became a crucial form of communication as well as commerce, they depended a great deal on communications themselves. This was particularly true when it came to the safe operation of trains over extended distances. While railroads used the telegraph to communicate between stations, there was no way to contact individual trains. 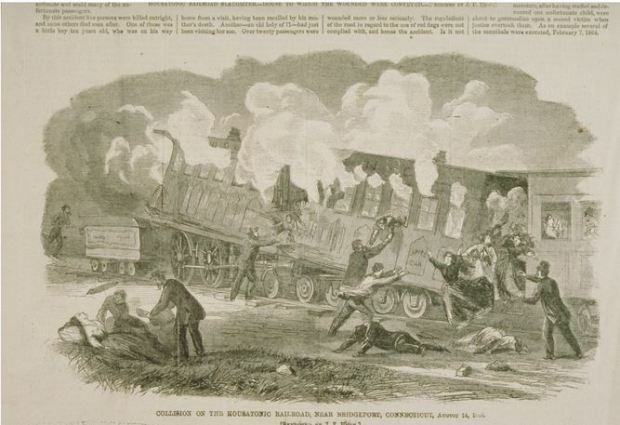 Railroads depended on written instructions called “train orders” to ensure safe operations. These train orders spelled out what a particular train was allowed to do between certain points. On single-track lines with trains operating in both directions, it was crucial that trains meet each other at places where a passing track was provided—usually at stations along the line. A train order might specify that such a “meet” would be required before either train could proceed. 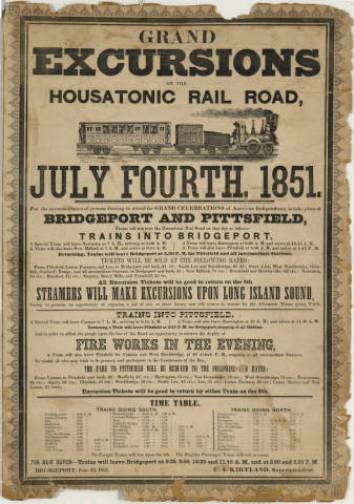 On August 14, 1865, the Housatonic Railroad was operating both freight and passenger trains on the southern end of their line connecting Bridgeport with Pittsfield, Massachusetts. A passenger train consisting of a locomotive and two coaches left Bridgeport that morning traveling north. Near Trumbull it encountered a north-bound freight train whose locomotive had become disabled. The freight train’s crew had correctly set out marker flags a safe distance down the track to warn approaching trains of the breakdown. With the line blocked, the passenger train crew decided to tow the disabled freight train back to Bridgeport, after which they would resume their trip north with their train. As the train was slowly backing its way toward Bridgeport, around a curve came a fast moving locomotive “running light,” that is, without a train in tow. The railroad was conducting road tests on a new locomotive before it entered service. That locomotive’s crew was unable to stop, and it plowed into the rear passenger coach of the other train with terrific force. The impact almost split the car in half lengthwise. The ensuing rupture of the boiler sent jets of high pressure steam into the shattered coach, scalding passengers who survived the impact. At least eight people died as a result of the wreck, with nearly a score suffering painful injuries. While many of the dead were from the Bridgeport area, ironically, among the fatalities was Corporal George Mansfield, a thrice-wounded veteran of the 2nd Connecticut Volunteer Heavy Artillery, who had been medically discharged only five days earlier and was returning home to Canaan after three years service in the Civil War. Tilden, S.D. “Map of the Railroads of Connecticut to Accompany the Report of the Railroad Commissioners, 1893.” Hartford, CT, 1893. University of Connecticut Libraries - Map and Geographic Information Center - MAGIC. Link.